The S1 sports a 9.4-inch screen with a resolution of 1280*800, and is powered by the Nvidia Tegra 2 chipset. 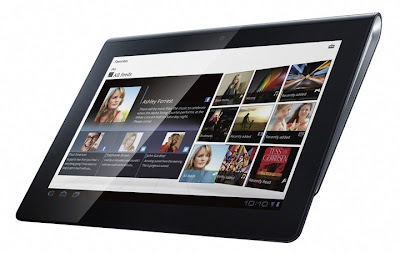 The tablet has a curve at the top, when held in landscape orientation, and an off-center gravity form-factor so as to give it a “magazine” shape. The second tablet – the S2 – sports two displays, each measuring 5.5-inches with a resolution of 1024×480. The two displays can be combined to be used as one large display for web browsing etc. The tablet can also be folded, so as to make it portable. The Sony S2 is like the bigger version of the Kyocera Echo. Sony has also modified the UI of the tablet to their liking, and integrated ‘Qriocity’ with it. Both the tablets are also PlayStation Certified, which means users will have access to Sony Ericsson’s PS Suite for a variety of PS1 and PS2 games. According to Sony, the S1 can also control majority of their home entertainment devices including AV devices, thanks to Infrared. The S1 and the S2 are the codenames of the ‘Sony tablet’, and Sony will be assigning these tablets a new name before it’s launched sometime this fall.